Bharat Sanchar Nigam Limited is one of the largest telecom providers in India; it is an Indian State-owned telecommunication company and it’s headquarter in Delhi, and Mr. Anupam Srivastava is the CEO of this Company it was started on 15th September 2000, It took over the business of providing of telecom services and network management from the erstwhile Central Government Departments of Telecom Services (DTS) and Telecom Operations (DTO), with effect from 1st October‘ 2000 on going concern basis. 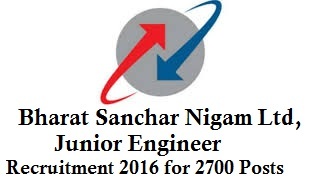 Candidates how are interested to apply for BSNL Junior Engineer – JE Posts , they are required to apply ONLINE from the BSNL Official website applying link www.externalexam.bsnl.co.in , and candidates go through all instructions before filling the Online application and candidates will have to provide valid Email ID and Mobile Number at the time of registration. 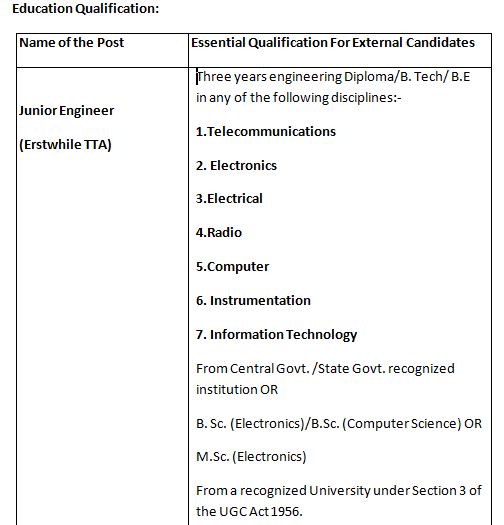 The application fee for the posts of Junior Engineer is 1000/- for OC/OBC candidates, and 500/- for SC/ST candidates. And candidates shall be paid online mode through i.e. Internet Banking, credit card and Debit card only, No other mode of payment will not be accepted. Fee once paid will not be refundable. Note: the minimum qualifying mark for each part is 30% for OC category candidates, and 20% for SC/ST/OBC category candidates, and the minimum aggregate qualifying marks will be 40% for OC candidates and 33% for SC/ST/OBC candidates. Candidates who ever not qualify in three parts will not be considering aggregate qualifying marks.